In two seasons, 1944 and 1945, Frank Martin Seward pitched, mostly in relief, for the New York Giants. His major-league career lasted just six days short of one full year and included only 26 games pitched and eight starts. He enjoyed more success in the minor leagues. His pitching helped the San Francisco Seals win two Governor’s Cup playoffs, in 1945 and 1946, as well as the Pacific Coast League pennant in 1946. 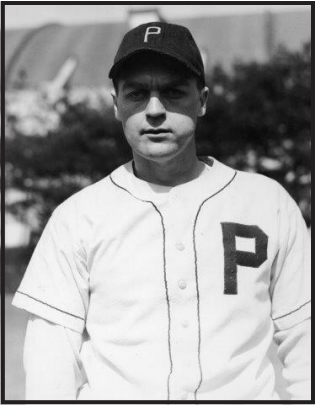 After three more seasons in the PCL and the International League, and facing mounting arm injuries, Seward retired from baseball in 1949 at the age of 28. Free to continue in baseball, Seward spent the 1943 season with the Springfield (Massachusetts) Rifles of the Eastern League, a New York Giants affiliate. The Virginia League had folded, so he returned to the Philadelphia area before the season. Seward tried out with the Phillies but manager Bucky Harris sent him to Springfield where his friend, Spencer Abbott, managed. Again one of his team’s younger players, Seward produced numbers that did not change much despite the move to a faster league. He appeared in 35 games with a 10-19 record and a 3.46 ERA. Seward’s only full season in the majors came in 1944. He started seven games and pitched in 25 contests for the Giants, earning a 3-2 record with a 5.40 ERA. His first appearance came on April 29, when he pitched the last two innings in a 5-0 loss to the Dodgers. His first start came on May 7 in the second half of a doubleheader against the Boston Braves. Seward took the 2-0 loss, giving up six hits before being replaced in the eighth inning. Five days later, in Cincinnati, his next start went poorly. He gave up three hits in the first inning, and then in the second the first two Reds batters got hits, too, so manager Ott pulled him. Seward earned his first victory on May 31, pitching a complete game in an 8-5 win over the Cubs at the Polo Grounds. Despite giving up two home runs amid six hits, Seward finally received some offensive support. Three Giants homered; one of them, third baseman Nap Reyes, hit two home runs and drove in six runs. In the seventh Seward helped his own cause with an RBI on a squeeze bunt. His second win came on June 18 in Boston when he relieved starter Rube Fischer in the second inning. Seward pitched the rest of game, giving up only two hits and one earned run. He hit a double—one of his two major-league hits—in the 9-2 victory. In his next start, on July 1, Seward lost, surrendering ten hits and five runs to the Cincinnati Reds in 6⅓ innings. His third and final win of the season came on July 7—a 6-2 victory over the Cubs at Wrigley Field. The next start, on July 16, did not last long. Spotted a two-run lead against the Philadelphia Phillies at Shibe Park, Seward lost the lead in the first inning. He faced two in the second before Ott replaced him. Seward made his last major-league start on July 23, lasting 2⅓ innings in a no-decision against the Cubs. Ott then optioned Seward to the Giants’ Jersey City farm team. Seward posted a 4-6 record with a 3.17 ERA for the Little Giants. He returned to the big-league Giants for one more game on September 22, pitching three innings of relief in an 8-1 loss to the Cubs at the Polo Grounds. Seward spent the rest of his baseball career, 1945 through 1949, in the minors. For the 1945 season the Giants exchanged Seward and pitchers Ken Brondell and Ken “Whitey” Miller for pitcher Ray “Cowboy” Harrell.10 The Giants’ pitching staff had been one of the majors’ worst (in 1944 their 4.29 ERA was second only to Brooklyn’s 4.68), so the move made sense.11 The three demoted pitchers had combined for 36 game appearances with a 3-4 record and 102⅔ innings pitched (78⅓ of which Seward supplied). The next year, 1946, the Seals fans set a minor-league attendance record (670,568), a mark that stood for nearly 40 years.13 The Seals responded, winning the league pennant and Governor’s Cup that year. First baseman Ferris Fain remembered the team quite fondly, as he recalled a four-game sweep of the Philadelphia Athletics during spring training. Fain specifically mentioned the Seals’ pitching. “We had one hell of a pitching staff. To get those kind of numbers that we had that year you gotta have pitching.”14 Contributing to this success, Seward went 15-13 to finish third in wins on the pitching staff, while team ace and future Giant Larry Jansen went 30-6. Ray Harrell, back from the Giants for the 1946 season, finished behind Seward in wins (13) but with a marginally better ERA (2.91). After baseball, Seward stayed in upstate New York, where he and his wife, Florence, raised two daughters. Needing a job but lacking any qualifications other than his baseball experience, he started at the bottom of the ladder, taking a job at a local Sun Oil filling station. From there he worked his way up to management, first of the station and then for the area. He managed a home-construction company and helped start the Elmira regional housing council. He retired in 1986. When Brent Kelley interviewed him for a book about the San Francisco Seals, Seward said he’d do it all over again, but would be a smarter player. When Kelley responded, “We learn as time passes,” Seward concluded philosophically: “Learn too late.”21 Seward died on April 12, 2004. 1. Robert Strauss, “The Drive-In Theater Tries a Comeback,” New York Times, July 23, 2004. 2. Brent P. Kelley. The San Francisco Seals, 1946-1957, 29, 30. 6. baseball-reference.com/bullpen/Virginia_League#1939-.2740_D_— _1941-.2742_C; accessed June 10, 2014. 12. Donald Wells, Baseball’s Western Front: The Pacific Coast League During World War II, 169-70. 14. Quoted in Kelley, 16.